Zombie TV thriller The Walking Dead has attracted its largest audience in the US to date, with 16.1 million tuning in for the return of the fourth series. In the coveted 18-49 age group, it was the top rated show across all US TV programming on Sunday, according to initial Nielsen data. The third series finale in March was watched by 12.4 million viewers. The AMC show follows deputy sheriff Rick Grimes as he tries to survive zombies in a post-apocalyptic world. The Walking Dead started in 2010 with an initial six episode run and was inspired by the comic book series by Robert Kirkman, Tony Moore and Charlie Adlard. 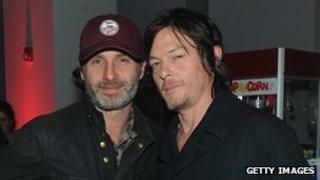 Andrew Lincoln stars in the lead role as Grimes, while fellow British actor David Morrissey joined the cast in season three as villain Philip 'The Governor' Blake. AMC recently announced it was developing a spin-off show of the zombie drama following a different set of characters created by Kirkman. The "companion" series is expected to air in 2015.